It’s a happy day in E7. 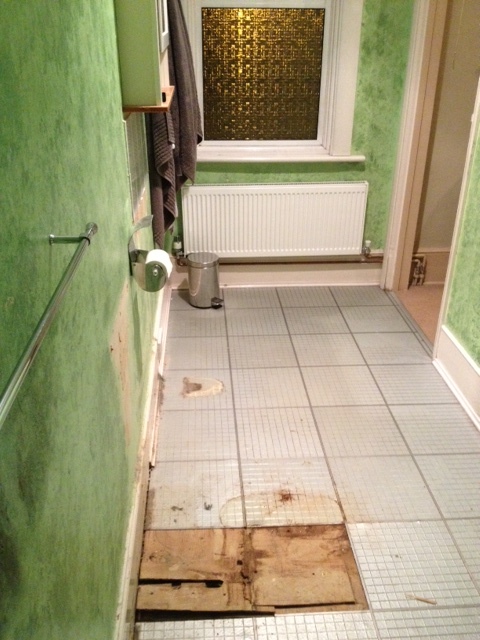 Today our slightly odd en-suite was mostly ripped out. I say slightly odd as the loo in the en-suite was a Saniflo toilet. This is one of those loos that doesn’t need to be plumbed in, and has a macerator underneath it. It’s a solution for spaces where you can’t make your bathroom waste pipe reach the soil stack, without making major alterations to your house. However, as we found when we moved in, our one was very loud (not ideal in the middle of the night) and quite smelly. We are lucky to have a main bathroom downstairs so we haven’t been using it since we moved in, so when we had a plumber coming to do a few other bits we decide to get rid of it! 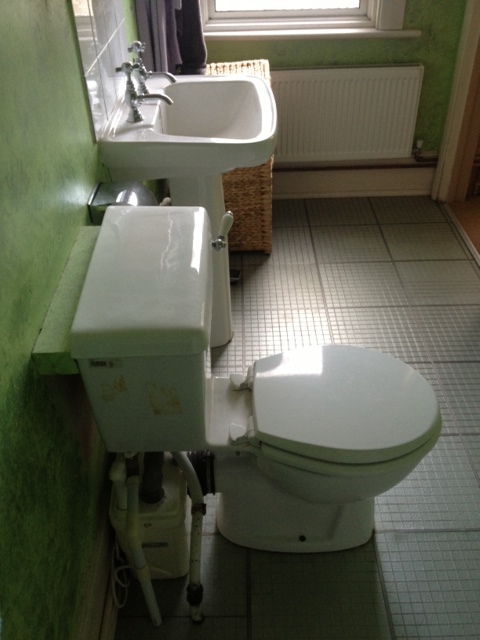 We’ve been consulting with builder and plumber friends and they think we should be able to plumb in a toilet, its just going to be a bit tricky as we need to run pipes underneath another room. Or raise the floor a little. This did have a fitted wardrobe at the end until today and a lot of leftover pipes from an old boiler, so our plumber has been working out which ones he can remove or take elsewhere. The plan, in the near future, is to try to run our waste pipe under this floor (our spare room) and out the back. At least the floor already had to come up when we rewired, so the disturbance has already been started, and we don’t need to use this room for a while (sorry would-be overnight guests!). The current en-suite is long and thin, and we are hoping to split the room into two, and use one end for a wardrobe, and the other end for the bathroom, moving the toilet as close to the back of the house as we can (which should mean it ends up just behind the wall in the picture above where all the pipes are). We have some complicated decisions to come about where to put doors, whether to change windows, and exactly how much hanging space we need in our wardrobe area – but that is the fun part to come! 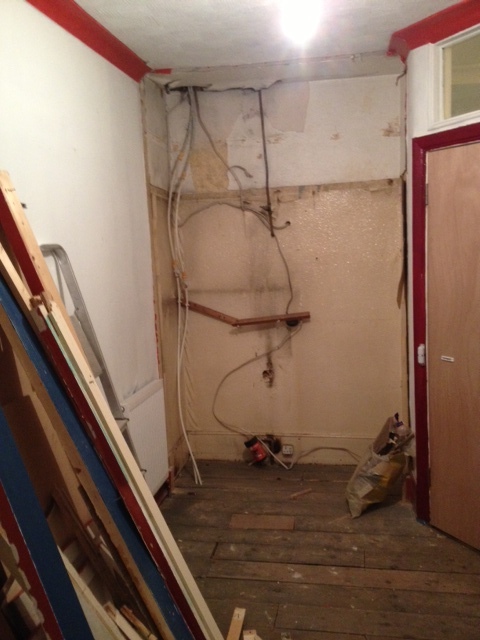 For now, we no longer have an old Saniflo in our bedroom (essentially, as the en-suite never had a door) and while our house is becoming more like a building site as the days go on, it all still feels like progress. In the meantime I will be dreaming of the massive luxury of having space to hang clothes and being able to go for a quiet wee in the middle of the night without waking the neighbours.